Reprinted from Cousin Joseph: A Graphic Novel by Jules Feiffer. Copyright (C) 2016 by Jules Feiffer. With permission of the publisher, Liveright Publishing Corporation. All rights reserved. Where do you go professionally and creatively after becoming a living legend in your field? 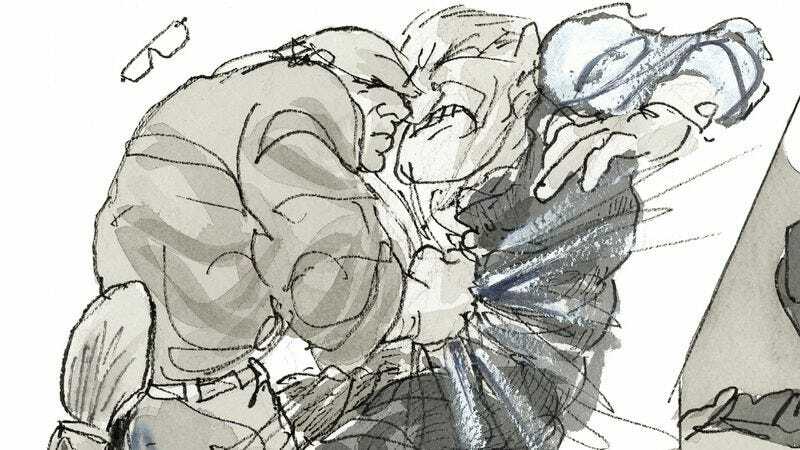 At 87, Jules Feiffer has had a career most cartoonists can only dream of, entering the industry by assisting one of the masters of graphic storytelling, Will Eisner, and eventually making a name for himself as a smart, cutting satirist with his long-running comic strip, Feiffer, and various works for the stage and screen. After spending most of the last two decades writing and illustrating children’s books, Feiffer made a triumphant return to his comic-book roots with 2014’s Kill My Mother, a crime noir graphic novel that spotlighted Feiffer’s commitment to continuing his growth as an artist. Kill My Mother combined all the skills Feiffer had learned from the various media he’d worked with in the past to create a compelling mystery full of twists and turns and overflowing with style. Tim O’Neil said it best in his 2014 For Our Consideration piece on Feiffer’s Kill My Mother: “Kill My Mother is a wonder of a book that, rather than using its author’s reputation as cover for its deficiencies, dares the reader to imagine another book this year, by any other cartoonist, feeling quite so vibrant and daring.” In that same piece, O’Neil explores the perils of achieving legendary status within an artistic community, perils that Feiffer has avoided by exploring different creative avenues and constantly challenging himself. He pursued playwriting and screenwriting while working on Feiffer, giving him a deeper understanding of dialogue that enriched his cartoons, and when the strip ended, he moved into the realm of children’s books to reignite his imagination and get back to a more joyful creative experience. Cousin Joseph is a more conventional crime noir than its predecessor, but limiting the scope of the narrative isn’t a bad thing. It gives the book a clear, direct focus, and Feiffer builds a full, layered story around his doomed lead character. It’s also wise decision making in regards to the structure of the overarching narrative across all three of the graphic novels in this trilogy (a sequel to Kill My Mother, The Ghost Script, is currently in the works). Having Cousin Joseph be a smaller story makes Kill My Mother a more successful sequel, taking the concepts and characters from the first entry and expanding on them in surprising, clever ways. Cousin Joseph works especially well as an introduction to this world for any new readers that start at the beginning, but those that have already read Kill My Mother get the added pleasure of knowing how the futures of these characters turn out. That dramatic irony adds tension as Feiffer sets up the chain of events that will lead to Hannigan’s inevitable death, events that allow Feiffer to explore the tumultuous political climate of the Depression and the dangers of blind patriotism. Sam Hannigan loves the U.S.A., hates what it has become, and is desperate to get back to an idealized version of the America that exists in his head but was never real. He works double duty on the police’s Red Squad taking out any potential Communist subversives and delivering music boxes full of cash to Hollywood producers, pay-offs from the mysterious Cousin Joseph intended to shut down features viewed as un-American. The women get short shrift in Cousin Joseph, with Hannigan’s wife and daughter (two of Kill My Mother’s leads) pushed into the background while the other women make brief, albeit important, appearances in the story. Valerie Knox is a 19-year-old obsessed with male genitalia, and her diary full of detailed accounts of her illicit affairs (many with underage boys) becomes damning evidence when her dead body is found at the scene of the strike outside Valerie’s father’s cannery. Cissy Goldman, a striking worker and mother of one of Valerie’s young targets, and Addie, a waitress with killer aim, round out the female cast, and while they each figure into some of the most affecting scenes in the book, their stories are an afterthought compared to characters like Hannigan, his partner Neil Hammond, and cannery owner Mr. Knox. That said, it’s easy to forgive the lack of female representation in Cousin Joseph given how much attention the women get in the sequel, and it makes sense that Feiffer would focus on the men when the story deals with traditionally masculine themes of asserting dominance and upholding honor. This book is all about power. The men in power go to great lengths to keep it, and Hannigan’s obsession with returning his country to power and safeguarding it for the future makes him vulnerable to manipulation by parties with ill intentions. Hannigan’s story proves to be extremely timely in a modern political climate where presidential candidates are trying to define what makes America great, and the most powerful scene of the book comes when Hannigan learns the story of a supposedly un-American film he’s trying to shut down for Cousin Joseph. It’s a tale of a half-Irish, half-Jewish kid from the slums who rises up to become a successful boxer and brain surgeon before enlisting to fight for the U.S. in World War I, and Hannigan doesn’t see how this celebration of American resilience and self-made success could be interpreted as a threat to the country’s ideals. Hannigan sees through the manipulation when Cousin Joseph becomes increasingly adamant that the production be shut down, and that discovery, combined with his interference in the Valerie Knox murder case, leads Hannigan on a path that ends with his death. It takes a lot of work to achieve that level of mastery, and after 80 years of working on his artistic skills, Feiffer has reached a point where he doesn’t fuss over unnecessary details because he knows exactly what he needs to include to get his vision across in an economical but impactful manner. There’s a wildness to his linework that brings a remarkable vitality to his art, and it takes a huge amount of control to maintain that scribbly quality while also depicting the story with clarity and depth. There were moments in Kill My Mother where Feiffer sacrificed clarity in favor of more expressive visuals and unconventional page layouts, and after trying out that approach, he moves to a more precise panel structure for Cousin Joseph. Most of the pages in Cousin Joseph feature white gutters between panels that don’t have the overlap of Kill My Mother, breaking down the pages into stronger individual beats. When Feiffer wants to speed up the rhythm of the page, he turns those white gutters into black lines, and he eliminates the gutters during moments when characters get swept up in their thoughts, like when Mr. Knox vows to take revenge on the workers’ union for his daughter’s death and Sam realizes he’s being played by Cousin Joseph. There are still moments where Feiffer employs a more ambitious layout—Sam’s drive through Bay City is used to introduce many of the book’s supporting cast members by having sequences of panels layered on top of a bird’s eye-view of the car’s path—but Feiffer isn’t trying to be especially showy with Cousin Joseph. Kill My Mother is a bolder work, but again that just makes it function even better as a sequel. Feiffer shows more restraint with Cousin Joseph, but that doesn’t diminish the quality of his work, which continues to be rich with character, style, and sociopolitical commentary. Feiffer’s living legend status hasn’t made him complacent, and his need to continuously evolve as a storyteller has produced two unforgettable works of graphic fiction, with a third on the way because there’s no need to slow down when he’s this passionate about the work.